Staples in Virtual World Games Article - Virtual Worlds Land! Rate this Article Virtual World games, are set to provide eager participants with a means to socialize with other online players/participants. These types of games throw you into virtual private chat rooms or public hangout spots - to get you interacting with other people inside its world. In this short article, we’ll tackle the staples in Virtual World games. At any given virtual game world, a start-up “avatar” to serve as your in-game character is probably the first staple that comes to mind when tackling their bunch. It makes a whole lot of sense that they are the most important thing in a virtual world, for the very people diving into these types of games are probably in for it with one thing in mind – to express themselves and socialize. And what greater way to socialize and express yourself than having something to represent your character in a virtual world than an avatar – personalized to express one’s self in a snap. The royal importance in these types of games is to express yourself to get to jive with groups of people to your liking, as well as for them to do the same towards you. Whatever role you play in a game, it is just but important that it gets you motivated playing it altogether. Having you grab a body of representation for you in the game, comes second to none in virtual world gaming. Next we have to push the “public rooms” as the second staple of virtual world games. What better way to showcase yourself than showing off in public rooms. With the general public looking for people to meet, a public room is their best option to scour and meet potential friends therein. That why it play an important role when playing in these type of games. Usually, when a newbie (new player of the game) picks up on a virtual world title, he/she initially visits the public rooms to find someone to interest them. With more people signing in to the public rooms, the better the chance for one to actually find an interesting bunch. Just as important as the public rooms, we also see the “private rooms” as a staple among the virtual world games. After getting familiarized with a virtual world, the next thing is to get yourself acquainted with groups of people that interests you or probably sharing the same interests as you do. Even in the earlier days of socializing with chat rooms, having met the group of people or a certain person that interests you, opens up the chance to seclude yourselves from the general public to have some private conversations of your own. This is where private rooms come in – to get you focused on you interests and get to be with people privately, and away from less important assets in the game. Virtual world games nowadays pick up on better laid out private rooms including your personal hangout place, get-away destination spots, private bars and clubs, and the like. Another staple in virtual world games are the “costumes” and “accessories”. 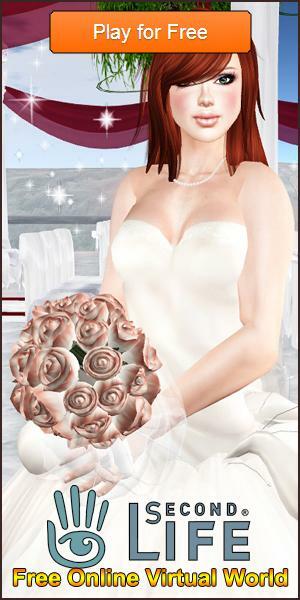 Games like Second Life, and IMVU perfectly demonstrates the importance of this staple in virtual world games. Getting your avatar some really impressive line-up of clothing should be enough to call forth attention from other players in the game. Depending on how you plan to show off your attitude, costumes and accessories are the perfect tool to obtain your needs. A simple tattoo for example should be enough to catch attention and details your acceptance to liberal state of mind and stuff. Likewise, costumes within the game should relatively state you fashion ideas and grab a hold of other people’s interests. Last on our list are the “emoticons and gestures”. Just as important as any key element in virtual games, emoticons and gestures find significant role in every single title. The probable cause for this is that people are enticed when they get to share their true feelings in the game. For instance, upon getting excited on the topic, on may simply dance out of joy, or roll out in the floor laughing. Better than words, emoticons and gestures perfectly demonstrates the actual state of mind of a person relative to the current situation they are in. Playing through countless number of virtual world games in the past, we came across several really interesting titles to get you socializing to the max. Hence, from these game we were able to draft some key aspects that we call ”staples” - that makes up a great, enjoyable game out of them.